Taking good care of your motorcycle is easy when you have the right Suzuki sportbike repair manual by your side. And the service manuals published by Clymer and Haynes, are the best out there. These shop manuals are for Suzuki sport bike owners who like to perform their own maintenance and repairs, and they feature text and photo how-to instructions that help you take care of your bike just like professionals do. Need to fix your Suzuki sportbike? Get the right repair manual. When you think of Suzuki sportbikes, the GSX-R or "Gixxer" as they're usually called, always come to mind. Not trying to put down other Suzuki sport bike models such as the Katana, SV650, Bandit or the GS, but GSXRs usually are top-of-mind when the words Suzuki and sportbike are paired. And Gixxers are among some of the fastest bikes on the planet. They qualify as... what's the technical term... badass bikes. That's it! But even the fastest badass production bikes need some TLC every once in a while, and it's a requirement if you want your bike to perform its best. The repair manuals we sell for Suzuki sportbikes, are written for the DIY owner who likes (or wants to) perform his or her own motorcycle scheduled maintenance, troubleshoot problems, service systems such as cooling (if so equipped), brakes, electrical, etc., all the way to a complete teardown and rebuild, including the engine and transmission. Doing your own maintenance, such as oil changes and such, will insure the bike runs properly and lasts longer, while maintaing a high resale value. And having the right repair manual for your Suzuki sportbike, will insure that any service or repairs you do, are done right. 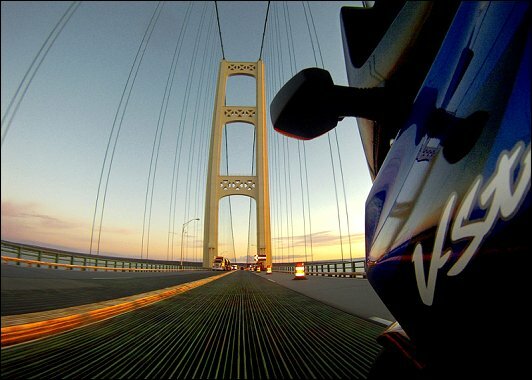 Above: Don Ruzek rides his Suzuki V-Strom 650 across the Mackinac Bridge (northern Michigan ) at first light, late summer 2010.